We Have range of quality steam shower folding seats that are extensively used in the steam & Shower bath rooms. Over the time, water & Steam can deteriorate the quality of the products and in order to avoid this we have make use of high grade mild steel and heat resistant paint. Further, as these seats can be folded easily, it helps in saving a lot of space. This sturdy fold-up seat provide affordable seating options for baths and showers. It allows bathers a place to relax and enjoy the soothing benefits of steam. Constructed of easy to clean materials, seat folds-up against the wall when not in use. Made with quality materials: Chrome plated cast aluminum frame and glossy coated teak wood planks. Recommended for new construction, so proper fastener support framing is planned inside wall. We are the most trusted name among the topmost companies in this business, involved in offering Shower Folding Seat Model 1485. Shower seats are a useful item to have, especially for the elderly or the disabled. There is a wide variety of shower seats available to consumers. These vary in size, shape, and material used. Plastic seats are a common choice, not only because of the ability of plastic to withstand the water but also because of the cheaper price. Plastic seats are not always the most comfortable choice. 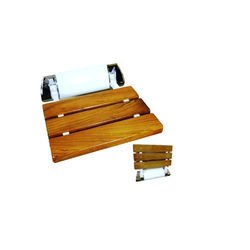 If someone wants a comfortable and high quality seat, they should consider buying a teak shower seat. Teak is a very strong and long-lasting wood. It has been used in furniture for centuries and has proven itself to be high quality. It is an expensive choice for a shower seat, but the benefits that it can provide often outweigh the cost. Teak is resistant to mold, mildew, and heat. This makes it ideal for the shower or tub. There will be no worry about ruining the seat and the strength ensures that it will be sturdy and safe in the wet environment. Since teak produces furniture that has a long life, a teak shower seat will last much longer than a more traditional plastic seat. The price is higher and this could cause potential buyers to think twice. But if they realize that they will not have to replace the shower seat for years to come, then it makes the higher price more reasonable. Teak is a beautiful wood, so it is visually appealing, even in the bathroom. It is going to bring a regal feeling to any shower or tub. This is a feature which may make teak more appealing to those that prefer beauty in their bathroom, rather than just function. 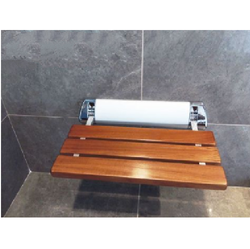 The Teak Shower Folding Seat come in many different sizes and shapes, just as plastic seats do, so consumers do not have to worry that their selection will be limited. There are also varying shades of the wood, so there is no reason to worry that there will be only one dark color. Overall, the higher price is going to provide comfort, quality, and reliability in the shower seat, one that is sure to last for many more years than a plastic seat. We are the most trusted name among the topmost companies in this business, involved in offering Steam Shower Folding Seat. We are the most trusted name among the topmost companies in this business, involved in offering Shower Folding Seat. Luxury fold up Acrylic shower seat / bench. 20" x 9" and projects from the wall 13"
The tilt-up seat easily mounts to any wall and conveniently tilts up after use, requiring minimal space. Attractive high-quality ACRYLIC is renowned for its durability and weathering properties. Ideal for use in stall shower or bath. This frame is available in polished brass and brushed nickel/polished nickel finishes to enhance the design. The tilt-up shower seat is supported with mounting bracket (included) for easy installation to a stud wall or header bar. It can be mounted on tiled or blocked wall. The mounting bracket must be anchored to a solid structure to assure safety and security. Complete installation instructions and component kit are included with the folding shower seat. 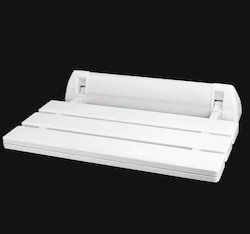 Bench Seat provides sit-down bathing comfort, add beauty, versatility, utility, and value to your shower space. Perfect for use in steam showers !